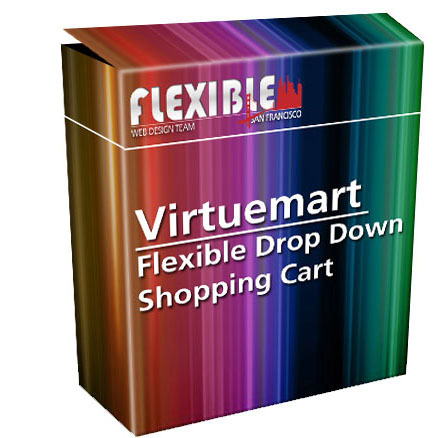 Dropdown shopping cart module for Virtuemart 3 and Virtuemart 2. This module lets you add product to cart without refreshing page and include product thumbnail inside the mini cart. It comes with 3 different theme. Pick one that you like the most. SUPPORT OPTION: If you are a developer and want to use this extension on multiple websites (domains) you designed, you should purchase this extension with +For Multiple Domains to avoid support restriction by domain. This option can't be added later. Comes with 3 different style-themes. 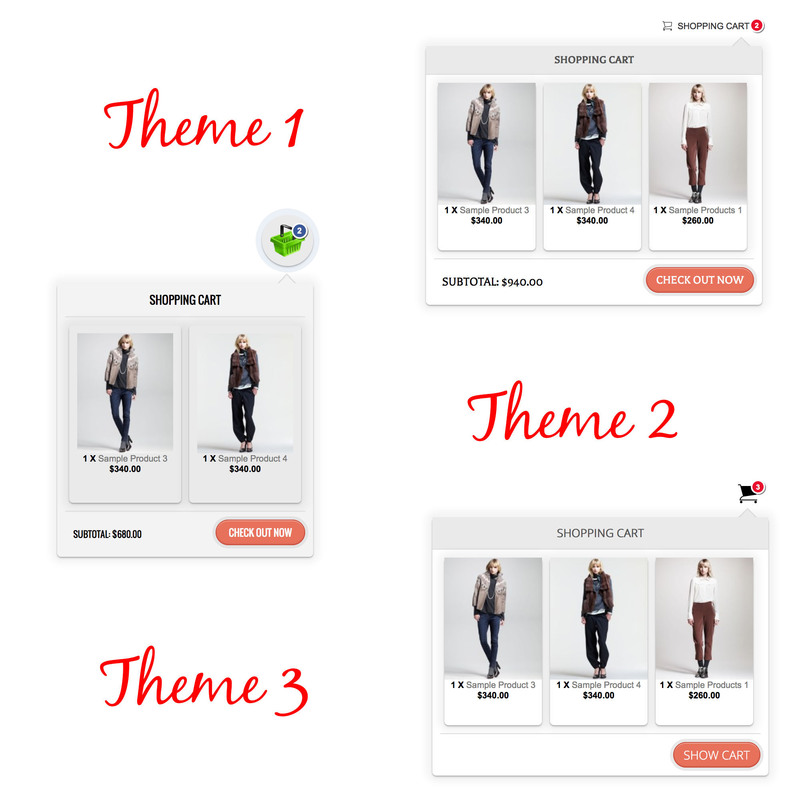 Flexible Dropdown Shopping Cart module comes with 3 different theme. You ca easily select a theme from the module parameters and go with that module. It is that easy! Easily customize it with user-friendly parameters. No need to be coder! You don't need to be coder to customize it. 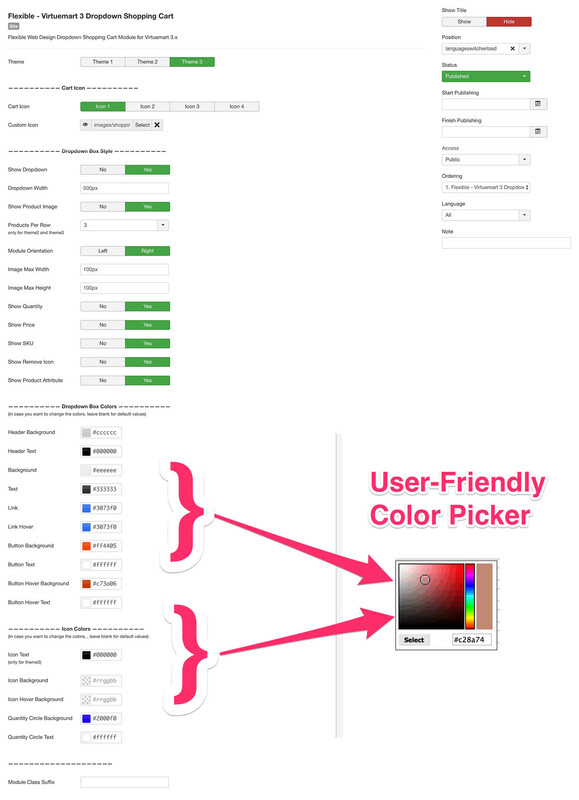 First, pick a theme that you are wiling to go with; then pick colors from module parameter through user-friendly "Color Picker" plugin. Click for demo. Everything is all set and ready to go for you. It is Multi-Languages and Multi-Currencies, out of the box! No need to translate anything. Our Dropdown Shopping cart will use what ever language or currency your Virtuemart uses. Everything will be automatic. Just translate your Virtuemart Component to your native language and apply the currency. Then everything will be set in terms of our Dropdown Shopping Cart. Worked out of the box, no issues and love the styles. Great job! I had a problem with an old virtuemart 2 site. While not strictly a matter for them, they are intervened and... BOOM!!... problem solved faster!. Now my site works fine and takes advantage of the new cart that makes browsing more enjoyable. Thank you very much!!! I bought this awesome extension for VM3, when I came to use it I didn't publish the plugin and I made a forum post as it wasn't working correctly (because I hadn't published the plugin) and I got a reply from support within 15 minutes!!! That's great support if you ask me, flexible web design are a credit to the Joomla community and you can buy all their extensions without worrying about support. Very good product! Easy to install, and do what they promice! Simply perfect! Elegant, easy to set up and use.And superb, unbelievably fast and efficient support. I can't recommend it enough! !